The Turkey Devonshire is a sandwich that comes from Pittsburgh, it was created by Frank Blandi. This delightful sandwich is made crisp bacon, slices of turkey, slices of tomato, and are covered in cheese sauce before being popped into the oven to become nice and toasty. A few years ago I spent a lot of time in Pittsburgh for work, I hate to tell you how many of these sandwiches I had, I couldn’t resist this kind of comfort food. The cheese sauce for this Turkey Devonshire sandwich goes well over steamed broccoli or even cauliflower. Enjoy this classic sandwich that is well-known in Pittsburg. 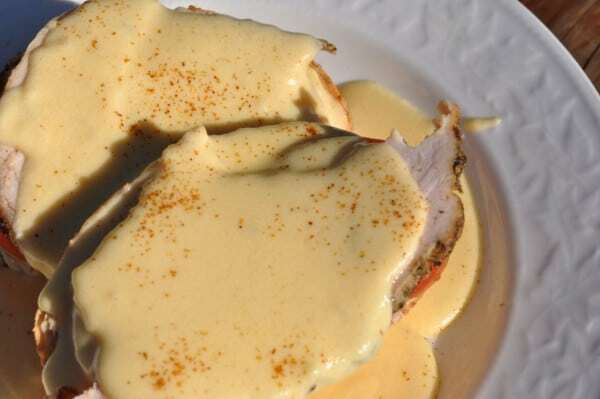 This open-faced turkey sandwiched is piled with sliced turkey, crispy bacon, fresh tomatoes, and a rice cheese sauce. In a medium-sized saucepan, melt butter and sprinkle in flour. Cook the butter and flour mixture over medium heat for about one minute before adding 1/2 cup of milk. Be sure to cook the flour an butter until it begins to smell nutty, this will keep the flour from tasting pasty. When adding the milk, be sure to stir, and allow the sauce to thicken before adding another 1/2 cup of milk. Once this becomes thick add dry mustard powder and half of the cheese, stir until all is well blended and the cheese has melted. Add in final amount of cheese and milk, and stir again until well blended. You may want to add a couple of drops of hot sauce like Tobasco to give the sauce a little extra heat if you desire. Build sandwich by laying a piece of toasted bread into a pie pan, or a heat-resistant plate, and top with bacon slices, then tomato slices, turkey slices, and pour about 1/2 to 1 cup cheese sauce over the sandwich. Place sandwich under the broiler in your oven until the cheese begins to bubble and turn brown. Never made with deli turkey – always real turkey!!!! I am from picksburgh and this recipe isn’t right either. No chicken broth and you have to use velveeta cheese ‘n at. alright then. Armstrong’s is the best so I’m definitely trying this recipe. I’m sorry, I’m from Pittsburgh and that is NOT how you make a Devonshire sandwich. You really need to get the recipe correct as it’s a classic. You use: 3/4 stick butter melted, 1 cup flour, stir add one pt chic broth stirring constantly, then add one pint hot whole milk continuing to stir constantly. Bring to boil stirring constantly and cook for twenty minutes. Let cool to warm temp. Mst ir with wisk untill smooth. Get one slice white toast points with the crist cut off and add 3 slices crisp bacon and thinly sliced turkey or chicken, top with sauce and sprinkle with butter and a liberal amts of paprika. Bake in 450% oven for approx 15-20 min untill hot and golden brown. Fresh tomato slices are optional and may be added before the cheese sauce if so desired. This is Franks original recipe from the LaMonte. I’ve been making it for years. This is how they make it. Everyone makes it different, doesn’t mean your way is the right way, the LaMonte didn’t invent it. WONDERING IF THERE ARE ANY WEINSTEIN FAMILY LEFT, THAT CAN GIVE THE ACTUAL ‘LIGHT, FLUFFY SAUCE INGREDIENTS TO THOSE OF US WHO MISS IT, AND NEVER DID FIND ANOTHER LIKE THEIRS’….I BELIEVE IT HAD ‘SHERRY IN IT, AND IT WAS MOUNDED SO HIGH, AND THIS WAS “THE BEST IN PITTSBURGH”….HOPING TO HEAR FROM ANYONE(EVEN THOSE WHO MAY HAVE WORKED AT “WEINSTEIN’S”………. Don’t you add cheese to the sauce? Having grown up in “The Burgh” and going to breakfast at this eaterey, I always loved their Eggs Benedict with Devonshire Sauce. This sauce is great on many things. Thanks for the recipe. Now….if only I could get the recipe for the Dicarlo’s Pizza that I used to always get on Saw Mill Run Blvd. I miss “The Burgh” sooooo much. This basically the Louisville speciality, The Hot Brown!